Play Swipe & Roll Slot Online with 500 Free Spins! Swipe & Roll is a 5 reels, 20 paylines online slot game by Net Ent. Swipe & Roll has Wild, Scatter symbols, Multipliers, Respin Wild, and Bonus Game features and an RTP of 96.35%. The best place to play Swipe & Roll is with us at Rose Slots, which is also home to over 500 leading UK online slots including Fluffy Favourites, Starburst, Rainbow Riches and Great Rhino. They always say you should never judge a book by its cover, and that's definitely the case with Net Ent's Swipe & Roll. To the untrained eye, this is a classically-themed slot game which has been designed to resemble an old fashioned jukebox - the kind which was popular in pubs and bars back in the 1960s. There's even a pub in the background, which has a fruit machine visible over to the right-hand side. How very meta! Let us be the first to tell you, though - this jukebox really knows how to rock and roll. 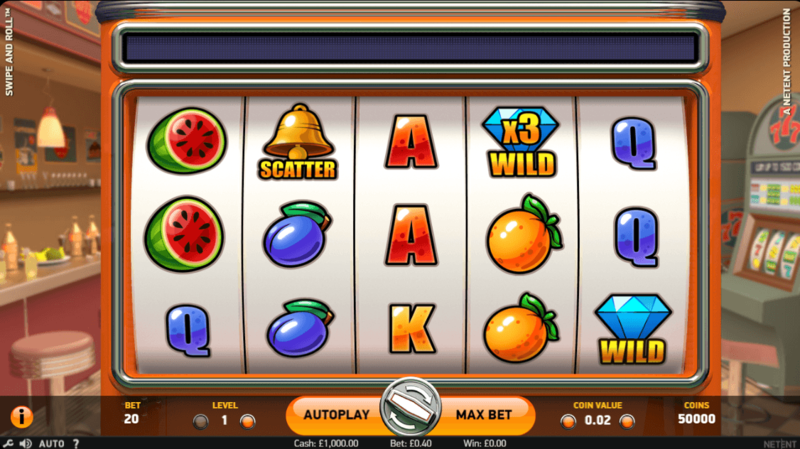 While on the one hand, this slot has a visual nostalgia theme - right down to the fruit symbols on the reels - this is anything but another member of the traditional school of online slot games. The design screams ‘classic', with a 5x3 layout and a comparatively modest twenty paying lines, but underneath all the decor it's hiding a powerful and generous array of fun bonus features and extras. Your first hint that there may be more going on than you'd expect in Swipe & Roll is the limited number of symbols. When there are very few symbols in the base game, you can generally expect there to be plenty of features to allow for variation. Swipe & Roll has only six basic symbols - playing cards Q, K and A, and a more valuable plum, orange, and watermelon. Cutting back on the basic elements means there's more room for special symbols, and so Swipe & Roll has two different wilds, and two different scatters. Diamonds represent both of the wilds. The first of them is the same type of wild you'll find in plenty of other online slots; it substitutes for everything apart from the scatters, and helps you to complete paying lines. The second does all of those things but also applies an x3 multiplier to the value of those wins. You can tell them apart because - helpfully enough - the multiplying wild has ‘x3' printed on it in bright yellow. As it's more valuable, the multiplying wild is a little rarer than its counterpart, and will only put in appearances on the middle three reels. One of the scatters is represented by a bell, and the other simply says ‘scatter,' and can only appear inside one of the bonus features. Both of them, therefore, have functions when it comes to the slot's bonus features, which we'll address now. This company's full name is Net Entertainment, but everyone (including them, based on their logo) knows them better as Net Ent. They were founded in Sweden in 1996, at first doing things the old fashioned way by designing slot games and other casino attractions for land-based casinos, but they soon saw which way the wind was blowing with the internet and made a move into online slots. They were early adopters of the new technology, which allowed them to expand rapidly into the emerging market before most other developers had even investigated the possibility of doing so. Its operations now expand far beyond the borders of its home country; Net Ent's Malta office is the homestead of all its UK online slots operations, and the company tells us that their products are now available in 24 different languages. That gives you an idea of the kind of global reach they command. With over 100 online slots currently available, Net Ent has a strong claim to being one of the very biggest slot developers in the world. It's impossible to choose a favorite from their extensive range, but we'd have to say that the eternally classic Starburst slot has to be right up there. It's certainly one of the most popular titles we offer at Rose Slots. As we promised, there are multiple bonus features to aim for in Swipe & Roll. One occurs randomly, the wilds trigger one, and the other is triggered by the scatters. The randomly-occurring bonus can happen at any time, and you'll know when it happens because all five regular reels will disappear! In their place, you'll get just one giant reel to spin, which can award you any of three prizes. This feature is called Coin Wheel and contains only three symbols. There's a special scatter which triggers the Swipe and Roll bonus game, a literal ‘coin win' which will award you a cash prize, and an arrow which expands the coin wheel by an extra reel, allowing more prizes to be won. Wild Respin is really a sticky wilds feature in disguise. When you land three wilds anywhere in view (either one of the wilds will do - they're both valid), they'll freeze in place for another spin of the reels. If more wilds are found, they'll also freeze. This continues until there are no more new wilds to be found, and winnings will then be counted up and awarded to you. The Swipe & Roll Bonus Game can occur one of two ways; you either need three of the ‘bell’ scatters to land during the base game, or you can access it by landing the other scatter symbol from within the Coin Wheel. You now have three prize wheels, which you control individually, and you can choose to swipe them up or down to win prizes. Any prize in view will be awarded to you, and the arrows can add extra rows to the reels to bring you even more wins. Swipe & Roll is a real delight - a slot that offers so much more than you’d expect it to if you went into it blind. We also can’t finish our review without mentioning the ultra-cool 60s rock and roll backing track, which is guaranteed to get into your head and stay there for hours. Don’t say we didn’t warn you.